This recipe is an excellent source of protein, niacin, vitamin B6, vitamin B12, iron and zinc; and a good source of fiber and selenium. Drain corn. Place on grid over medium, ash-covered coals. Grill, covered, 20 to 30 minutes, turning frequently. 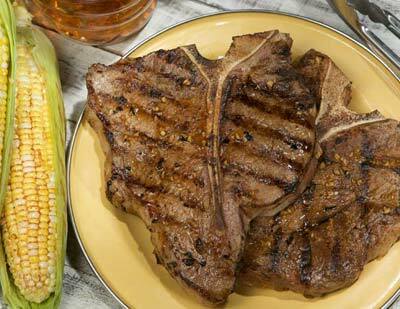 After 5 or 10 minutes, place beef steaks on grid with corn. Grill, covered, 11 to 16 minutes (over medium heat on preheated gas grill, 15 to 19 minutes) for medium rare (145°F) to medium (160°F) doneness, turning occasionally. Combine glaze and butter in 1-cup glass measure. Microwave on HIGH 1-1/2 to 2 minutes, stirring once. Carefully peel corn; brush with chili butter. Serve with steaks and remaining chili butter.